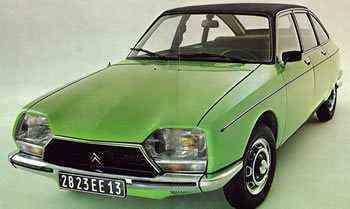 Citroen GS (and GSA), introduced in 1970, resembling a small DS, with hydraulic suspension, front wheel drive and 4 disc brakes, uncommon at the time for a family car. Top properties as overhead camshafts, integrated flat headlights and streamlined windshield, resulting in a low CW-value, earned the title of ' car of the year '. It were those properties combined in the GS, which contributed to the current standard in the automotive industry . This site is for all who try to keep it on the road.